The law on the High Anti-Corruption Court came into force on Thursday, June 14. The law was adopted by the Verkhovna Rada on June 7 and signed by Ukrainian President Petro Poroshenko on June 11. The document was published in the parliament's Holos Ukrainy newspaper on June 13. According to transitional provisions, the law enters into force on the day after publication, except certain clauses that come into effect with the commencement of the work of the court. 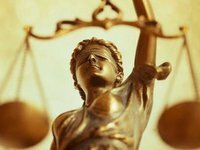 Poroshenko expects the High Anti-Corruption Court to be established before the end of this year.